President Obama spoke with @MayorSRB today "on efforts to address the demonstrations and maintain peace throughout the city." After consultation with Baltimore City Police Department, tonight’s game between the Orioles & White Sox at Oriole Park has been postponed. Announcement on make up date will be announced ASAP. #Orioles #WhiteSox. White House senior advisor Valerie Jarrett also spoke with @LarryHogan today about the situation unfolding in Baltimore, per WH. Loretta Lynch, in her first meeting with President Obama as AG, updated the president re. the events in Baltimore, per WH. 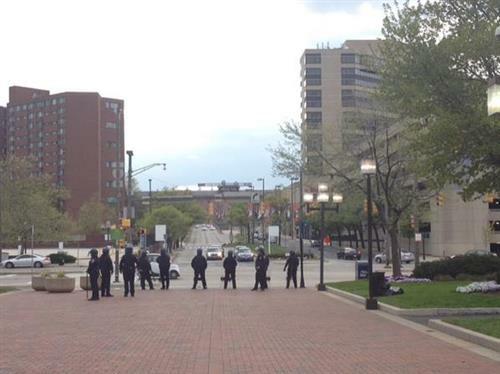 The Johns Hopkins campus is quiet as usual - nobody violently misappropriating #FreddieGray memories here. Charles Village is calm too. 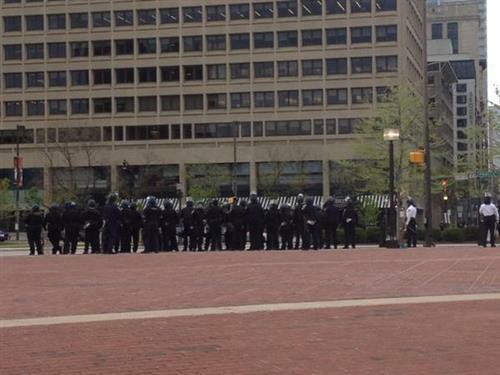 A group of individuals remain in the area of North Avenue and Pennsylvania Ave. They are destroying property and have started a fire. People have asked if this was about Freddie Gray. Yes, the those who started this yelled "Justice for Freddie." Add Gallery Grill and Cozy Corner to the list of businesses along Centre Streets in Mount Vernon to those damaged. Many also just expressed anger about police, their neighborhoods, police in their neighborhoods. Elijah Cummings on CNN: "people are just very, very upset." "We will find the people that are responsible and we will put them in jail," @BaltimorePolice Capt. Kowalczyk said earlier. 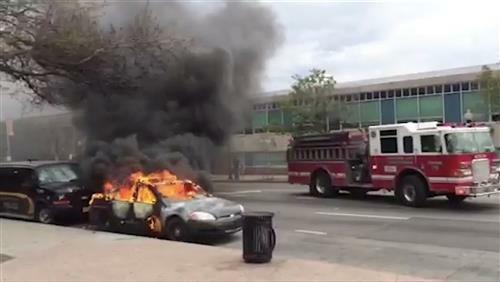 VIDEO: A fire truck responds to a police car on fire at Pennsylvania and North Avenue. Elijah Cummings on CNN: "as it gets dark, things get much more difficult." 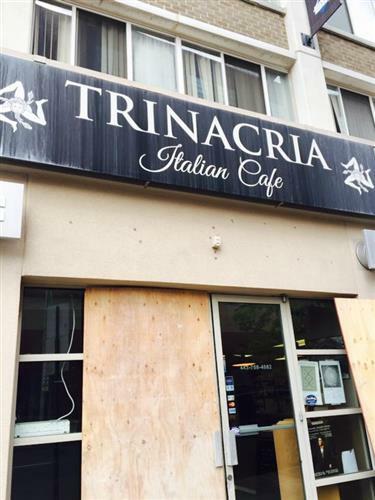 Construction manager on nearby project sent his crew --and plywood--to cafe to board up his business and save from looting. Elijah Cummings says on CNN that 150 ministers will be meeting in a few minutes to discuss the looting. Dan Harrington of Saje Build plans on boarding up some vandalized buildings in Mount Vernon. Reporter who knows streets of #Baltimore better than anybody else-@justin_fenton "people don't fear the police, they're emboldened now"
"Today's looting and acts of violence in Baltimore will not be tolerated," Larry Hogan says. 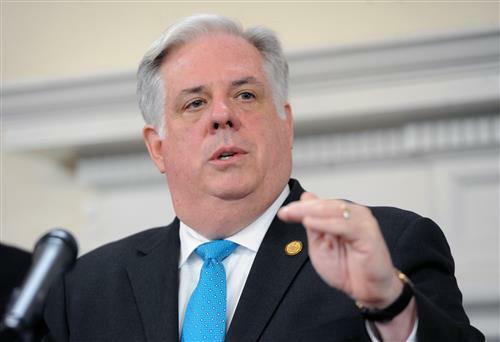 baltimoresun.comMaryland Gov. 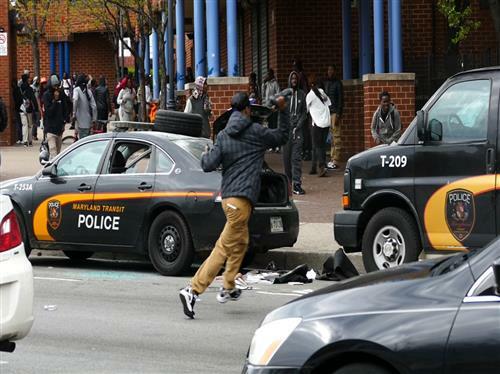 Larry Hogan put the National Guard "on alert" Monday after violent clashes broke out with police in Baltimore following the funeral for Freddie Gray in the morning. We are working with our partners in the Baltimore City Fire Dept while they put the fire out at the business - Pennsylvania /North Ave. This is the GOOD NEWS coming out of Baltimore... 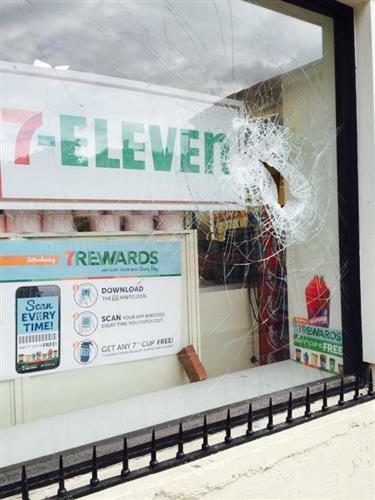 Neighbors helping neighbors repair vandalized cafe. This is so sad. Violence does not help. Just saw state police tactical vehicle pass Camden Yards. 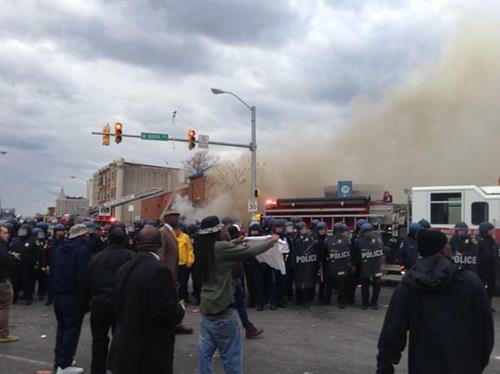 VIDEO: Rioters loot and destroy a Maryland Transit Authority police car and van. Haven't heard from @justin_fenton in 45 mins. Hope you're safe out there.